Living on the east side of Cleveland, I often feel like I'm on the "wrong" side of town. Although I've done plenty of exploring in and around my neighborhood, I normally can't find restaurants or bars that I like as much as places across the river. Although it's almost blasphemous for an east sider to make the trek to the west side, I'm glad that I'm able to venture out that-a-way once in awhile. This past weekend I had the opportunity to "lunch" with some of my lady friends at Deagan's Kitchen and Bar in Lakewood. Any "mainstream" restaurant that offers a vegan entree on their lunch menu (in addition to a weekly vegan and vegetarian night - Wednesday, if you're into that sort of thing) seems pretty exciting to me, so I was happy to have a reason to head west and check this place out. I'd walked past Deagan's plenty of times, but I'd never bothered to look inside. It's a neat space with exposed brick, beautiful wood floors, and a nice sized - but not intrusive - bar. When we arrived at noon, the restaurant was sort of empty-ish, but when we left near 2:00 pm, it was hopping with people watching sports and families having brunch. You might not expect those two things to go together, but in Deagan's, it works. 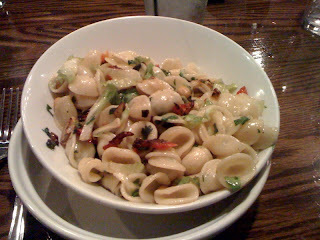 Any chance I get to order vegan food, I do, so I ordered the vegan orecchiette pasta. It was a nice mix of sun dried tomatoes, chick peas, pasta, and EVOO that was surprisingly flavorful. A tad heavy on the oil, but...overall a good meal. For a girl with a hearty appetite, this meal left me feeling satisfied but not disgusting for eating the entire portion. I'd call that a win. Thanks for coming in. I'm glad you enjoyed your experience and hope you can make it back often. Just a quick FYI, the Tomato Bisque is made with vegetable stock, so it's vegetarian-friendly. Also, make sure you get the Crisp Eggplant next time. I eat it at least 3 times a week. It's fantastic. Thanks.